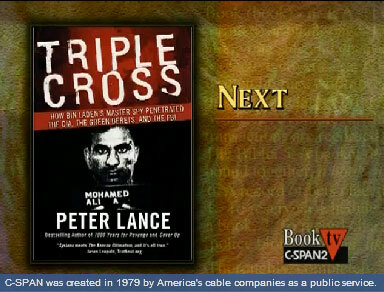 Peter Lance talked about his book Triple Cross: How Bin Laden’s Master Spy Penetrated the CIA, the Green Berets, and the FBI(Harper Paperbacks; June 16, 2009). He talked about the events leading up to the September 11, 2001, attacks, focusing on failures in acting on intelligence and on Ali Mohamed, an al Qaeda double agent who was able to penetrate the Federal Bureau of Investigation (FBI), Central Intelligence Agency (CIA), and the U.S. military before being brought to justice in the late 1990s. He argued that before September 11, the war on terrorism was largely a legal war, focusing on prosecutions and freezing assets. Mr. Lance, who criticized the performance of then Assistant U.S. Attorney Patrick Fitzgerald in his book Triple Cross: How bin Laden’s Master Spy Penetrated the CIA, the Green Berets, and the FBI–and Why Patrick Fitzgerald Failed to Stop Him (William Morrow; September 5, 2006), also discussed Mr. Fitzgerald’s threats to sue Mr. Lance and his publisher HarperCollins over the publishing of the paperback edition of the book. Following his remarks, during which he showed slides and graphics, he answered questions from members of the audience.